Col. Joseph A. Hoecherl, an US Army Apache Program Manager, was born on Jan. 8, 1967, in Lansing, Michigan. He graduated from Shawano High School in Wisconsin and enlisted in the Army Reserve at age 17, beginning his lifelong military career. He attended the University of Wisconsin-Madison from 1984 until 1986, when he married and switched to active duty. In 1990, he finished his degree at the University of Central Florida, re-entered the Army as an officer and attended flight school at Ft. Rucker, Alabama. In 1993, Hoecherl became an Army helicopter pilot, qualified in the UH-1, OH-58A/C, CH-47D/F and, finally, AH-64D. 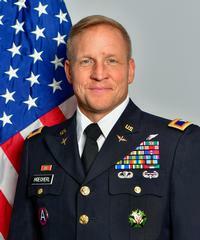 During his 30+ year career, Col. Hoecherl traveled extensively with his family, and earned an MBA from Embry-Riddle Aeronautical University, a Master of Information Technology from the Naval Post-Graduate School, and a Master of National Resource Strategy from the Eisenhower School at the National Defense University. He spoke several times at the Annual Forum and other Vertical Flight Society events. In 2016, after completing the Apache transition course, he returned to Redstone Arsenal, Alabama, where he took over as the Apache Program Manager. In April 2017, he was diagnosed with Stage IV cancer, but continued to work full-time while fighting cancer, until January 2018. Hoecherl passed away on May 2, 2018. He was 51.